This problem follows on from Isometric Areas and More Isometric Areas. 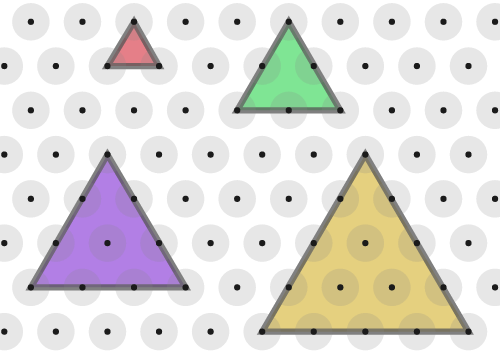 You may find it helpful to use the isometric dotty grid environment for this problem. When working on an isometric grid, we can measure areas in terms of equilateral triangles instead of squares. Here are some equilateral triangles. If the area of the smallest triangle is 1 unit, what are the areas of the other triangles? Can you see a relationship between the area and the length of the base of each triangle? All the triangles in the first image had horizontal bases, but it is also possible to draw "tilted" equilateral triangles. These triangles all have a "tilt" of 1. Can you convince yourself that they are equilateral? Can you find their areas? Take a look at the hint for ideas on how to get started. 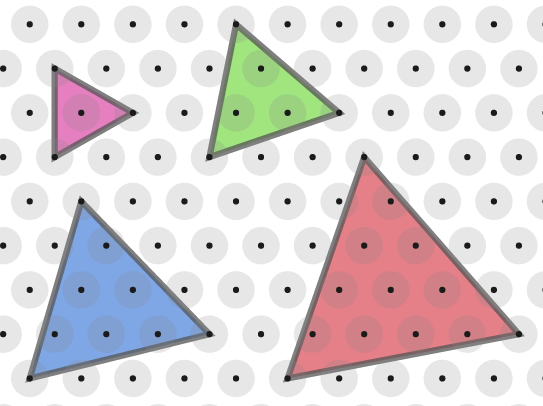 Can you find a rule to work out the area of any equilateral triangle with a "tilt" of 1? Can you explain why your rule works? What about areas of triangles with a "tilt" of 2? What about areas of triangles with other "tilts"? Sine, cosine, tangent. Limits. Mathematical modelling. Calculus generally. Creating and manipulating expressions and formulae. Trigonometric identities. Area - triangles, quadrilaterals, compound shapes. Generalising. Making and proving conjectures. Mathematical reasoning & proof.